Thanks to Paul Nelson of the Postal History Foundation for this update. The Meter Stamp Society’s library has been added to the Postal History Foundation’s Peggy Slusser Memorial Philatelic Library in Tucson, Arizona. Rick Stambaugh, current president, and Joel Hawkins, immediate past president, of the Meter Stamp Society recently placed over one hundred books, catalogs, machine handbooks, and over ten postage meter machines with the Slusser Library. 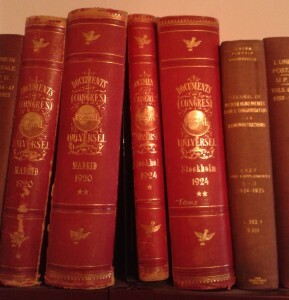 These are from their own libraries, as well as from the MSS library itself. The recent generous donation to the Slusser contains some duplicate items, and it will take some time for Valerie Kittell, Slusser’s librarian, and her staff of volunteers to catalog everything. After the cataloging is complete, the holdings will be included in the Philatelic Union Catalog hosted by the APRL as well as in the Global Philatelic Library hosted by the Royal Philatelic Society London. Duplicate material will be offered for exchange or sale. Rick and Joel have exhibited meter material, with award winning results, at many APS exhibitions. These markings are certainly examples of modern postal history, and the machines that create them are complex devices from a wide range of manufacturers. Many philatelic groups from many countries have published comprehensive information about their country’s meters; many of these publications are represented in this donation. 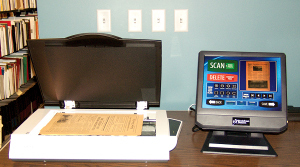 Rick and Joel have used this research material, as well as their own collections, to create and publish a catalog of U.S. meter marks, which is available from the MSS website. Furthermore, they recently released an electronic catalog of international meter stamps. This publication, which is free to download, is a wiki catalog, and subject to frequent additions and updates. It is not unusual for archival material to find its way to philatelic libraries over time. These libraries are natural—and understandable—repositories for research and reference material once a collector has closed his or her albums for any number of reasons. Often this information is available from no other source, partly because it may deal with specific and intricate details of philatelic topics. Far better that this material is offered to libraries rather than tossed into recycle bins. An exhibit on personal libraries will open Nov. 15 and run through Jan. 6, 2014 at Penn State’s Pattee Library. I get many questions from readers of this blog and the Philatelic Literature Review about personal libraries and archives, so if you are planning to visit the American Philatelic Center in Bellefonte in the coming months, you might consider a side trip to look at this exhibit. Penn State’s University Park campus is just over 10 miles from Bellefonte. At the end of September, I had the pleasure of visiting the Collectors Club in New York. 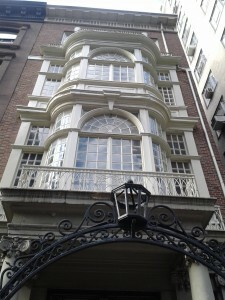 It was a beautiful autumn day as I approached the Club’s five-story brownstone in midtown Manhattan. The building was beautifully redesigned by architect Stanford White in 1902 and has been the Club’s home since the 1930s. 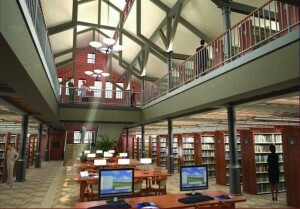 It was renovated in 2000 and provides an elegant setting for the Club’s extensive library. The library is open to the public five days a week and is easily accessible, located within walking distance of both Grand Central and Penn Station. It is a member of the Philatelic Union Catalog, and you can search its holdings by selecting CCNY from the list of libraries. Library Chair (and APRL Trustee) Bruce Marsden started our tour on the fifth floor, which houses catalogs, including extensive runs of Scott and Stanley Gibbons. We continued to the fourth floor, where treasures of the collection are housed. These include rare books, an extensive collection of Universal Postal Union documents, and photographs of the Knapp collection. This area is also used to process incoming material. The third floor houses auction catalogs. Many philatelic libraries struggle to find enough space for their continually growing, yet infrequently used, collections of these catalogs. 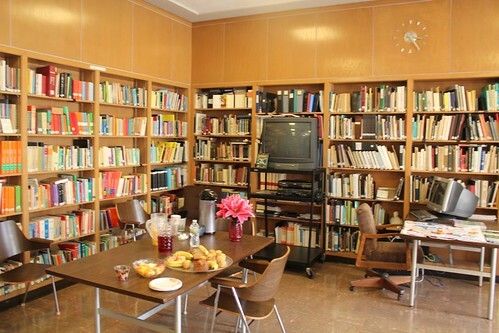 The Collectors Club Library, with finite space and no way to expand, has made the decision to downsize its collection. After consulting with specialist societies, they selected auction houses to keep and offered the remainder to the APRL. While I was at the Collectors Club, my husband and I sorted through the German auction catalog collection and boxed up the catalogs the APRL needed. We ended up with 10 boxes of catalogs! 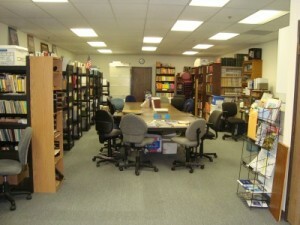 The Club’s meeting and reception space is on the second floor, separate from library collections. The front room has a table with comfortable chairs and a fireplace, all framed by the large window. 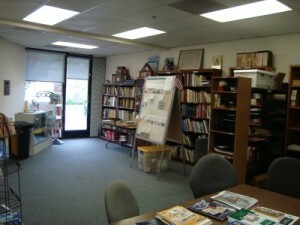 The back room provides space for presentations and exhibits. The main library collection of books, pamphlets, and current periodicals is in the first floor reading room. Like most philatelic libraries, the primary organization is geographical. The rest of the periodical collection is housed in compact shelving in the basement. 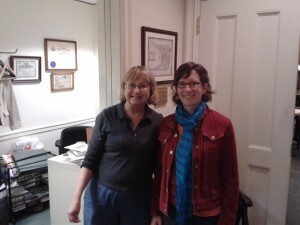 While I was at the Collectors Club, I also met with executive secretary Irene Bromberger. 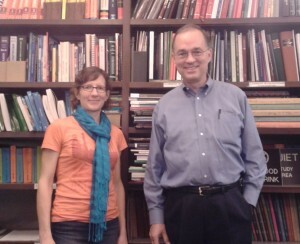 Irene assists visitors ranging from philatelic researchers to people who are curious about the building’s architecture. 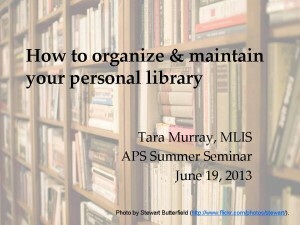 During the APS Summer Seminar last month, I presented an elective on organizing and maintaining personal libraries. It was recorded and you can watch it on YouTube. The newest member of the Philatelic Union Catalog is the Northwest Philatelic Library in Portland, Oregon. You can find their holdings in the catalog by selecting NWPL from the drop-down list of locations. The NWPL now using the union catalog as their online catalog. The Collectors Club in New York also uses the union catalog as their public catalog. Earlier this month, the Spellman Museum of Stamps & Postal History celebrated its 50th anniversary and hosted a symposium, “From Indian Trails to the Birth of a Nation.” The Spellman, located at Regis College in Massachusetts, also includes a library and participates in the Philatelic Librarians Roundtable. APS Executive Director Ken Martin attended the symposium and shared some photos – check them out on our Flickr page! On Sunday, I visited the Western Philatelic Library in Sunnyvale, California with volunteer Roy Texeira. Click on the image to view a slideshow of photos from my trip, and watch for a more detailed report in the 2nd quarter issue of the Philatelic Literature Review. 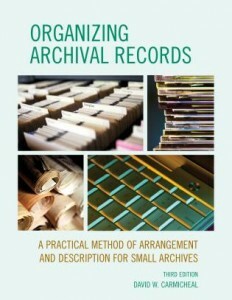 This guest post was written by Scott Tiffney, APRL Reference Assistant. While I was attending SANDICAL on behalf of the APS back in February, Bill O’Connor afforded me the opportunity of visiting the San Diego County Philatelic Library at its new location in Poway, CA. The SDCPL had its genesis in 1923 but its actual appearance came in the late 1970’s through the revenues of the annual SANDICAL show and under the leadership of the newly formed San Diego Philatelic Council. 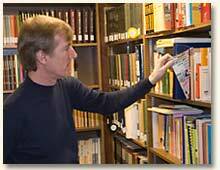 The SDCPL has grown over the years to include an extensive collection of over 7,000 books, catalogs, monographs, journals, and other ancillary items. Staffed part-time six days a week by volunteers from area stamp clubs with Don Hager as the current Librarian, the SDCPL is believed to be the only philatelic library open to the general public and members in Southern California. While Don and the other volunteers are still in the process of acclimating the collection to its new location, the library’s catalog can currently be accessed via a .pdf file on its website: SDCPL Catalog. One very unique and inspiring aspect of SDCPL’s history occurred fairly recently and was articulated by Bill O’Connor at the annual SANDICAL awards banquet in February. It concerns a new SANDICAL award, the Ralph M. Armington Memorial Award. Ralph M. Armington was a long time volunteer with the SDPCL. He was a retired Navy Chief and lived in San Diego in his retirement. Ralph was never married, and had no close family members. Over the years he volunteered tirelessly at the last three locations of the SDCPL. He did not drive, but was able to manage a very difficult bus schedule, often taking up to two hours to make his weekly shifts at the library. Upon his untimely death a short time ago, very little was known of his personal life outside of his volunteering at the SDCPL. Ralph died alone but left the largest portion of his estate to the SDCPL and a smaller portion to a San Diego area Children’s Hospital. His generous donation will enable the SDCPL to continue its mission of providing not only a place where the general public and members can meet and conduct research, but his gift will also enhance the stamp collecting hobby in Southern California for years to come.